RJ: I know, Martha, that we’ve talked before about the difference between taking 30 shots on film and taking 130 on digital. Sometimes it can be hard to tell who shot a photo. I’m wondering if either of you think digital photography can be artistic? Cooper: Of course. I think digital photography can be anything that any other kind of photography can be and more. I’m a big fan of digital photography, but it took me a long time. I used to say, “When it goes digital, I’m out. That’s it. I can’t do it. I won’t do it.” I was not an early adopter at all. In 2001 or 2002, I got a little Olympus and started playing around with it. That’s when I realized, that there were so many things that were better than film. Like how you can change the ISO. I always shot with Kodachrome, or Fuji 100, and if it got dark I had to push the film. With digital, you can change the ISO with every picture, and the color balance too. You don’t have to worry about filters or any of that stuff. Plus you can see what you’re getting right away and correct it. With film I was always making mistakes. I love that part of it, and still do. With film, it was all guesswork and you wouldn’t see what you were getting until two days later. By then, it was too late to reshoot. I used a bracket like crazy, and I used to think that every time I pushed the button it was $.50. I don’t understand the mystique of film. People who use film are constantly telling me how wonderful it is. I don’t get it. I don’t miss it. 40 years of Kodachrome, and I don’t miss it. I’m out of there. Lorimer: I didn’t get my 1st digital camera until pretty late in the game, 2003 or 2004. I regret not taking everything in the largest size possible with my first digital camera. I’ve got pictures of Faile stencils from 2005 that are 200 kB – people ask if I can send it to them in hi-res, but I can’t. RJ: How do you feel about things like watermarking or people reposting images without credits? Lorimer: I think people are very fast and loose with photo credits. I’m not going to name names, but there are certain sites where I’ve just given up trying to go after them. Cooper: I don’t generally put watermarks on my photos. It’s just too much work. But I do it for my old stuff, and I try to keep all the old photos offline as much as possible. I license those pictures, and I try to make money from them. It’s not like I make lots of money but I do need to live. Stock photography used to be a major part of my income, but it’s dwindled. Cooper: Yeah. Then the rights that people are asking for, for the amount of money that they’re willing to pay, is ridiculous. People are constantly saying, “Oh we’re doing a documentary on old-school Bronx graffiti,” and when I look at the contract for the rights it’s always “in perpetuity not just for this particular video but for anything in the future including things that have not been invented yet.” You might think, “Well, what’s that?” That’s the contract that I signed for Style Wars. There’s something like 23 photos of mine in Style Wars, for which I think I got paid something like $20 each. In that case, “not yet invented” included the DVD and everything digital. I do feel stupid about signing those rights away. We don’t know what’s going to be invented, and I don’t really want to sign “in perpetuity.” I’m extremely cautious about licensing now, but sometimes it works out. RJ: Luna, have you done a lot of licensing? Lorimer: I haven’t licensed anything. The only thing I’ve ever shot that got any sort of licensing interest was The Underbelly Project. It was the photos that were in the New York Times. I got a call from some guy at an agency. It was a real hard sell, with him telling me I have to act now and that the interest is limited. He sent me a contract, and it was the same thing: I had to give them all of my rights to the Underbelly photos in perpetuity, not even control who they then turn around and sell the photos to. I said, “No, thanks.” Maybe I missed out on a couple hundred dollars worth of photos, but I think I made the right decision. RJ: What do you want to do with your photos once you’ve taken then? Cooper: I want to publish in print media. That was always been my thing. Of course that’s gotten really hard. I don’t want to publish street art, and I have no street art books in the works. I did two little sticker books, but they were very specific and fun to do. I would like to do a Baltimore book, that’s a whole other thing, but another street art book isn’t on my bucket list. Why would it be? There is so much available out there, and I don’t have a particular point of view about it that I think would make a good book. Lorimer: That’s ultimately my rationale too. Unless I come up with something novel or something to set my book apart from all the other street art books that are out there, there’s really no point. Cooper: I’m happy to license photos to other books, but I don’t really see myself doing street art book. I don’t know what it would be about. Cooper: Nah. In some ways the festivals are the least interesting. They’re most interesting in terms of meeting and hanging out with the artists. At Open Walls Baltimore, I met Freddy Sam and he invited me to South Africa. But most of all I like the surprise of going through some neighborhood and seeing something that I didn’t know was there. To have everybody painting legal walls is not as interesting to me as being surprised by something. Lorimer: The internet is both the best thing and the worst thing to happen to street art. The worst thing is that in many cases I’ll already know what I’m going out to shoot, so the entire element of surprise and discovery is lost. That was what got me into photographing street art in the very beginning, before every piece was excessively documented and on Instagram or Twitter 20 minutes after it is finished. I really miss that moment of “Wow.” I spend a lot of time walking around New York, and, on my way to and from things that I know are there and that I want to photograph, I’m obviously open to finding whatever it is that I see along the way. I always have my camera with me, so there’s a certain percentage of things that I still just come across, but the internet has dampened that aspect of street art photography and documentation. I almost enjoy shooting in cities outside of New York more because the element of surprise is greater. I love to travel, and part of traveling is just walking around strange cities where, unless I’m with somebody who I know from the scene who is guiding me, it’s all about just being open to finding what it is that happens to be there. Cooper: That’s when I’ll photograph completed pieces, I don’t need process when I discover them. I love to walk around and find things. I love stikman. I love little things like that. stikman in Manhattan. Photo by Luna Park. Lorimer: He’s got great placement, and I enjoy that he’s constantly reinventing himself. With a lot of the artists who have their logo or their character, it’s just the same thing over and over again, but with his stuff, you start to walk past it and it makes you stop and look. He’s special to me for that reason. He gets it. Good placement and changing things up are really the two key things that make work on the street interesting and unexpected. RJ: Are either of you eventually going to do something with your archives? RJ: Like, would you donate your archives to a library? Cooper: Well I would hope to donate them somewhere before I die so that it doesn’t all get thrown away. Luna at least has all digital photos. All my slides are getting harder and harder to scan, because people don’t have the scanning equipment. Lorimer: I’d like to think that all this work hasn’t been done for naught. I would like for someone looking back on this period of time to be able to access these images in a meaningful way. I’d like to have them be organized as well so that you could say, for example, “here are all the pieces by Swoon captured on the streets between such and such a time.” I think there’s a value to the collection. Whether an institution will want it or not, I don’t know. Swoon in Manhattan. Photo by Luna Park. Cooper: There’s a value, but whether anyone will ever want it as much as they want it now is hard to say. They might want one or two images out of the thousands that I have. It’s impossible to predict. I’d like to think that my collection would end up somewhere where somebody will care about it, but whether I’m going to get to a point where it will be accessible, I don’t know. I’m not all that interested in scanning and labeling. RJ: Do you ever feel pressure to take photos? Lorimer: I’m happy not to have to monetize any of this, because it makes things so much easier. Most of the pressure I feel is pressure that I put on myself. I want to document things well and in a way that is respectful of the pieces. That’s what pushes me out the door every weekend. I’m not complaining, but I feel like I’ve set the bar high and now I have to keep up with it. I’ve got a lot of people nipping at my heels, but that’s okay. It’s not a competition really, and the way I see it is that at the end of the day, I see a lot of amazing art and travel to lots of places and meet wonderful people and whether or not I get a good picture out of it, that’s great, but the experience is what’s interesting to me. Cooper: It’s disappointing to me if I don’t get a good picture. I like all that other stuff, but the bottom line is, if I can’t get good pictures I’m disappointed. Lorimer: Sure. My camera is screwed right now and nothing upsets me more than that I can only take fuzzy pictures. Sam3, MOMO, KUMA, CURVE and RISOT in Queens. Photo by Luna Park. Lorimer: I’m proud of the fact that the history of graffiti is, in part, being written by two strong women that are part of it, but independent as well. There’s something to be said for that. Especially because of all the haters in the beginning who were like “You don’t know anything.” That motivated me more than anything. Not too long ago, I was out in Queens shooting a wall and this guy came up to me. He said, “Oh, white girl coming to the hood. You’re a culture thief.” So I rattled off every single name on the wall and his jaw dropped. RJ: I loved being in Baltimore with you, Martha. We went out to dinner with the Open Walls Baltimore group and you were like the Den Mother or something. Cooper: It always surprises me that so many of these artists from around the world know who I am. So many of them do come from some kind of a graffiti background. Even people like Ever whose work is so far removed from graffiti now. A lot of them did start out with letters. Lorimer: And if not letters, with your book. Cooper: Well that’s less and less now. That’s two generations ago. Now they’re starting out with the internet. They don’t need to start out with a book. RJ: To what extent to either of you feel like you were caught in the right place at the right time? Cooper: Well, I was in the right place at the right time and had the energy and the idea to keep my finger pressed on the shutter. It was luck to be there, but more than luck that I actually photographed it. Lorimer: That was a lot of work. Cooper: And I can think of lots of things that I probably should have photographed but I didn’t; things where I was in the right place at the right time, but I didn’t take pictures. RJ: And Luna, you caught the Flickr bug before a lot of people, right? Who else was around when you started? Lorimer: The two really go hand in hand. Flickr and street art happened at the same time for me. It was this perfect storm. There was all this great stuff going on out there on the streets, so I went out to take pictures to put them online. All these artists started coming out of the woodwork to say, “Hey, that’s mine.” This dialog started, people began inviting me to events, and the whole thing just snowballed from there. RJ: So I’m just realizing this now. Martha, you came across the people and discovered that there was art, and Luna, you saw the art and then discovered the people behind it. Right? Cooper: True. And Henry was like Luna. He was interested in the art and then met the people. To me, the art was the last thing. The culture came first. SMELLS, UFO and DROID of 907 Crew in Queens. Photo by Luna Park. Lorimer: And for me the culture has become more and more interesting as I’ve gotten deeper into it. 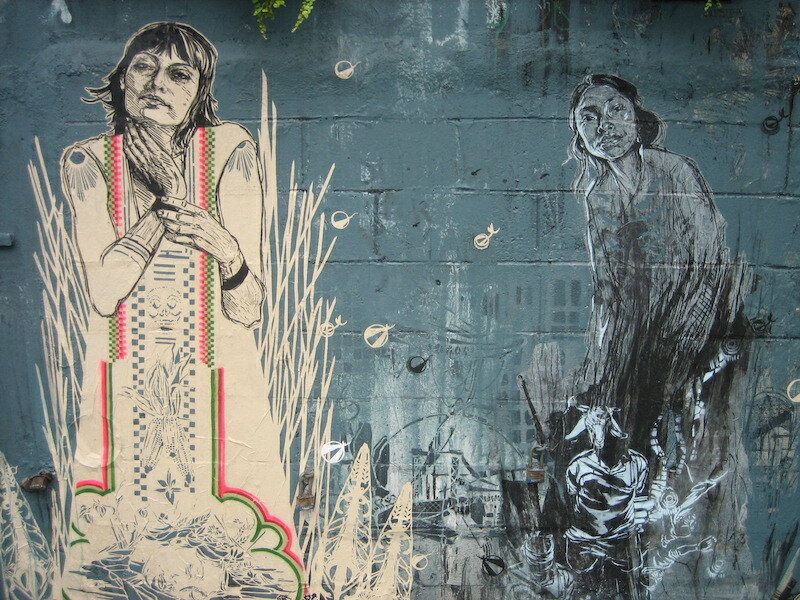 I started with street art in Brooklyn by the likes of Swoon, Faile, and Elbowtoe. But the more I started digging, the more the history of graffiti became more interesting to me. I would even say now that the graffiti aspect is becoming more interesting to me than the street art aspect, because the history is so much richer, and it’s something I can learn about. Which is not to say I’m uninterested in street art. I’m really interested in people who blur the lines between street art and graffiti, artists who aren’t so easily categorized. That’s crews like Burning Candy and 907. People who are outsiders doing their own thing and who have the respect of their peers. Cooper: And I’m interested in techniques. I’m interested in seeing that there are so many people using rollers and house paint rather than spray paint. That’s capturing my imagination. 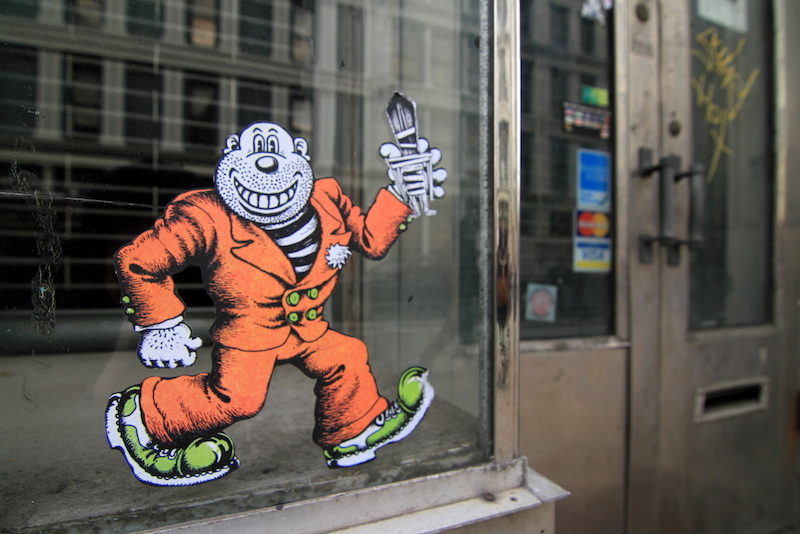 Lorimer: Well, particularly in New York, if you get caught walking down the street with a spray can, you’re gonna get in trouble, whereas with a bucket of wheatpaste or a roller, you’re not going down as bad. In the increasing police state in which we live, people have to find creative ways to get up without getting caught. Cooper: And that’s the part that interests me, how they are managing the do all of this. I’d like to go out on more illegal missions, but I don’t really like going out in the middle of the night. Lorimer: I have a 9-5 job and responsibilities. There are opportunities that present themselves, but A. I’m a horrible climber, and B. I’m afraid of the consequences of being caught in the subway when terrorism charges are being thrown around. Cooper: So what do you see as the future? What’s happening? Lorimer: For all the street art that’s broadcast across the internet, you simple don’t experience it the same way without context. I’m increasingly moving towards the point where I would rather turn the computer off and go outside to experience life and whatever I come across than stress about going to Bushwick because there’s that mural I saw a picture of that I should probably take a picture of. Cooper: Yep, that’s me too. Lorimer: Sure, I look at a ton of street art online, but it just pales in comparison with going outside and looking at your own city. I get emails all the time from people who ask, “How do I find street art?” People should just go outside. Go to whatever cool part of your town and you’ll find stuff. To me, seeing work on the internet or using mural locating tools is like short-changing yourself. The whole idea is to go out and experience your environment, notice something wasn’t there before, or have a piece change your perception of a spot because of thoughtful placement. Good street art, where someone’s thought about the context and made something that’s clever or provokes a reaction, to me that’s far more interesting than half of the things you see online. Cooper: Yeah, I’m with you. I just wanna be surprised. RJ: Martha, what were your early experiences like of seeing graffiti online? 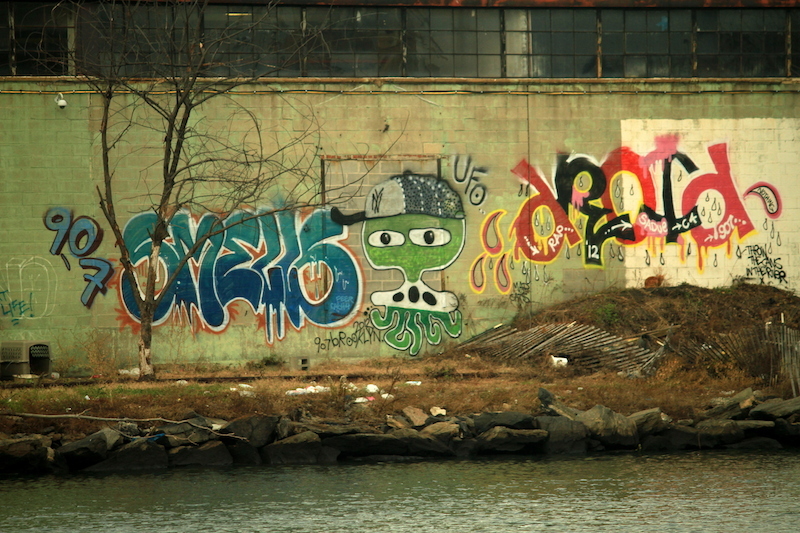 Cooper: When I heard about Art Crimes and that people were putting graffiti online, I thought, “That is amazing. I can’t believe it.” The whole idea of a website was a new thing, and the idea of a graffiti website was fascinating. And now there’s a million graffiti websites. I’m interested in how the entire art world has changed because of graffiti, and I think that there has been a shift, especially because of street art. It has changed people’s perception of what is art. Lorimer: I think it’s remarkable that you have this truly global phenomenon, well first graffiti and now street art. I don’t know where it’s going, but there’s something to be said for this artform being democratic and with low barriers to entry. There are kids all over the world picking up spraycans or brushes or whatever. There’s something really magical about that.